: So, how ya been? I thought we'd catch up and chat about how things have been going. Clementines are in season, of course, and we go through at least one bag a week here because all the kids like them and I love them. 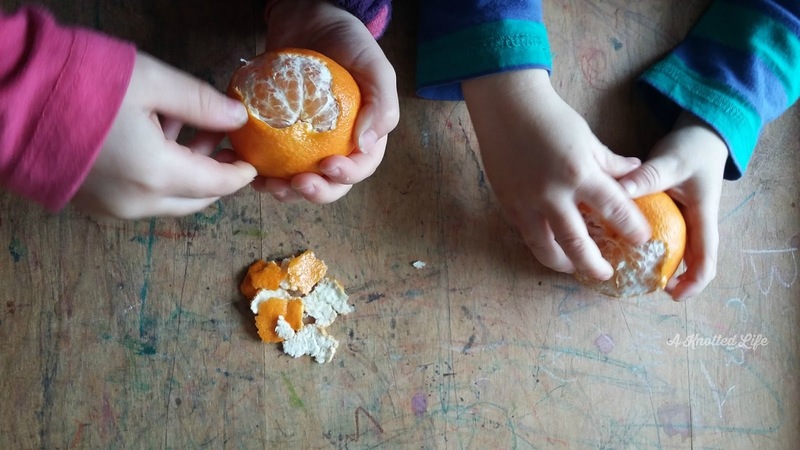 Clementines mean winter to me, winter and cute little fingers peeling, peeling, peeling. I got the outside decorations mostly up, but I realized Mary and Joseph need new lightbulbs. Commence search. 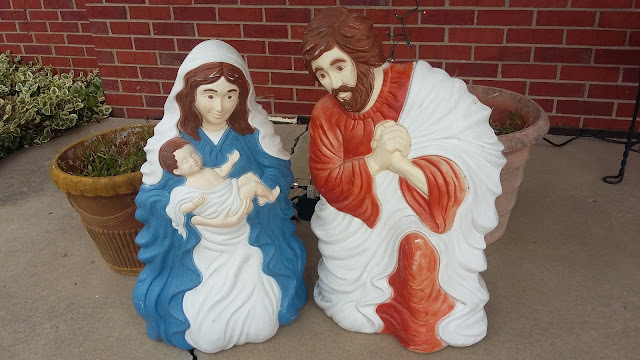 Eventually I will cut some greens to fill the flower pots by the Holy Family and to fill the basket that sits at my front door. But I'm happy with what we've got. 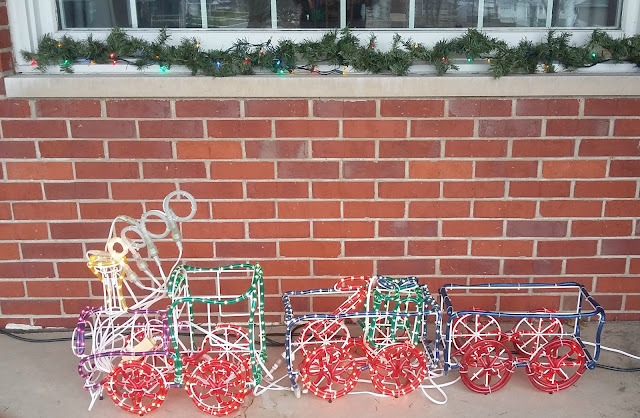 The kids looooove the train and I feel ridiculously proud of myself for figuring out its set-up. I don't have Advent candles for our wreath yet, just a little votive candle sitting where the first week's purple taper should go. I'm reading Isaiah right now in my Bible but I'm finding my prayer time so dry. Those two facts seem to compliment each other, at least in my mind. St. Nicholas on the 6th: stockings will be filled when the kids wake in the morning and maybe we'll eat Shepherd's Pie for dinner because we all love it, not because it has anything to do with St. Nick. The kids' school break starts on the 16th and the feast days stop so we'll see how this all goes. Today I wanted thumbprint cookies, though Jofis wanted chocolate chip cookies incredibly badly. 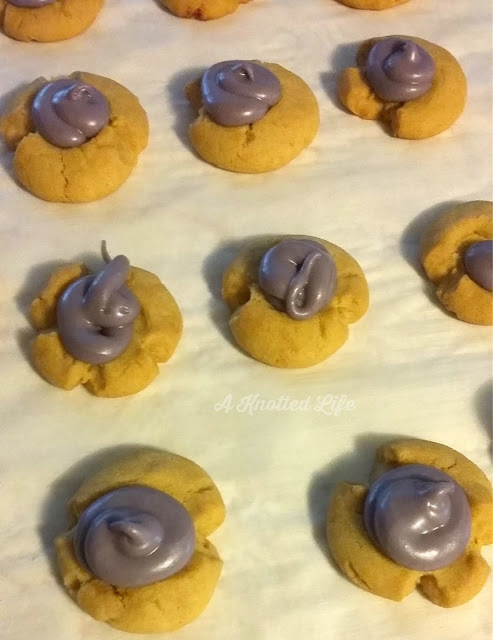 I told him that we should make the thumbprint cookies, though, because we could frost them with purple Advent frosting and that would be super special. He was half convinced but then he got to lick the beater, roll the dough, smoosh his thumb in the dough balls, and eat frosting. So he stopped complaining. We're listening to Advent music around here, but not too much of it. I have a playlist (o'er there in the sidebar) but I'm also trying to have silence in the house. Gee golly, it's nice. I will share one success, if you will allow me to. This year we're doing the Jesse Tree and it finally feels good - like they're getting it. The three oldest kids all have Religion in school and they are learning so much. It's good to see that what we've been trying to do for years is being nurtured at school and then they come home and we can continue to build on it. This relates to the Jesse Tree in that each night I read from the booklet that came with our set. I do this sort of read + ask questions so the kids tell the story + summarize the Scripture and then the child of the night finds the ornament that goes with the Scripture. It's like, this is what it's supposed to be! And it only took 6 years! Finally, Likable Art shared this new video they made for Life Teen and I thought it was so beautiful. What about you? Got any successes or struggles to share? How's life treating you? Hope you are having a wonderful advent! Bonnie, those Advent thumbprint cookies are the bomb!!! I love that idea so much. Thanks for sharing your Advent experience with us! Bonnie - thInk about tortilla soup for Our Lady of Guadalupe day. Very easy to do without dairy and super yummy and warm. I made a huge pot with left over turkey after Thanksgiving, and it was amazing, but it's great with chicken too. What Jesse Tree set do you have? I'm on the hunt for a new booklet/reading option for our kids. The kit I got just has the Scripture readings, and they list GIANT readings for each day, so I feel like half our Jesse Tree time is me trying to winnow down the readings into something they'll actually listen to.